Do users understand how my interface functions? There are lots of different ways of measuring the intuitiveness of a user interface, but task-based tests are the most trusted method. In a nutshell, you give users a job to complete on the interface, and then observe and measure what they do. Task-based tests are a commonly used method in moderated user testing sessions because they directly simulate what happens to users in the real world. This example asks participants looking at the interface to try to view a list of saved or highlighted conversations. This is a test of the icon, navigational element design, and overall layout of the screen. To confirm that this design is performing well, you want to see at least 80% successful clicks on the target. Test participants struggled to complete this task. The target ‘show bookmarked’ navigation element was only successfully clicked by 30% of the participants. This is good data to get — we’ve just found an area that we can improve on. But what exactly is it that needs to be improved? Do users understand what the icon means, but can’t find it in the layout? Or are users seeing the icon, and not clicking on it because the meaning is ambiguous? We’d need to run similar tests on variations of the design to find out. 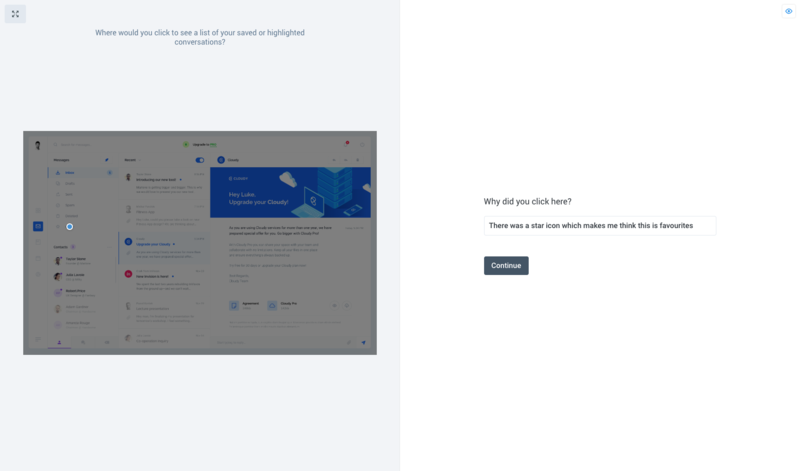 These tests are simple to run, but the results give you a deep insight into how your site can be better, and how you can optimize your interfaces for maximum usability.